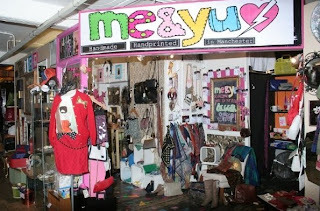 Me&Yu is a quirky, individual brand specialising in handmade and handprinted garments. I hadn’t heard of them until I found out that my workmate Hannah from Patterned Tights is doing her placement year with them. I’ve been having a nosey on their website, and I’m pretty impressed. 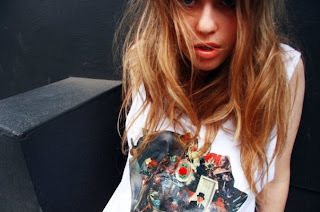 I love the quirky prints on their sweaters and hoodies, and I love all the Vintage pieces too! I’m a little spoilt for choice. Here a few things I am lusting over right now! 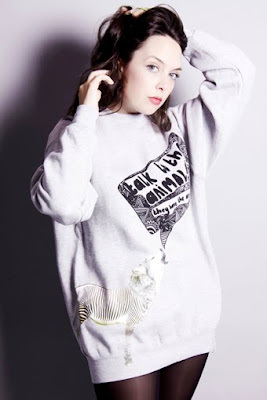 Firstly this oh so cosy ‘Animal Man’ montage print sweater, available in black, white and grey. I love this print! Imagine this with some leggings and comfy boots. Ahh 🙂 Or better still, layered over a collared floral dress for a completely different edge. Want want want! This one is £32.00 and you can find it HERE. Secondly, this ‘Talk To The Animals’ sweater in grey, at £34.00 is another of my favourites, and its also available as a jumper dress if you wanted something a little longer. However I love this version, and if you do to, then you can get it HERE! Also at Me&Yu, you can choose what neckline you want on your sweatshirts too, which is an added bonus! You can have a normal sweatshirt style round neck, a cut, folded and sewn style like the one above, or a slashed one for a slouchier look. Now this, I LOVEEE! I was going to buy it today, but then I remembered I have a car to tax, so I will have to sort my money situation out first. This beauty is a sale item reduced from £30.00 to just £15.00! Its very me, and I want it so bad! Defiantly one of my favourites on the site. Find it HERE. I’d urge you to have a look on the site at the sale as there’s some really cool things on there at great reductions! The company also have a FACEBOOK page where you can be updated on all the happenings of the team and where abouts they will be selling. There’s also some great imagery on there of past and present campaigns and shoots they have done. These are a few little gems I found on their page! As you can see, their clothes are really versatile and individual, so whether your a bit of a rock chick or into your pretty vintage finds, then there’s going to be something for you on their site! Like what you see? I know I do and I’m defiantly going to be scraping my pockets to get that dress! If you can’t get to Manchester, or simply want a better look at what Me&Yu is all about, then here are some links for you to nosey at. Let me know what you think. I’ll be popping a permanent link in my sidebar, and if you need any more info just ask! "I had a haircut today."